I don't know, really. Don't really want to be mean, but just try to open it once and then be patient. When that bubble "Now online." shows up, try logging on to SFO. Anyway, can you get GV to work with other games? GV only works on your computer's main Admin account. Well, all I can say is to use a Moderator for a spectator in multiplayer games. Sorry man! C'mon now ive emailed and still banned from sfo. Ive done nothing wrong for cryin out loud...what makes this damn bot think im cheating? So yea... I'll try shooting an email when I have time and see if that helps. Quote[/b] ]I don't know if ive been banned or what, hopefully its a GV bug but when i enter my password and the menu comes up it says " For extensevly breaking the rules of sfo. Cheating or associating yourself with groups or people who perform illegal game activites You are now locked from sfo. " Then i see the GV logo on the top of the paragragh. 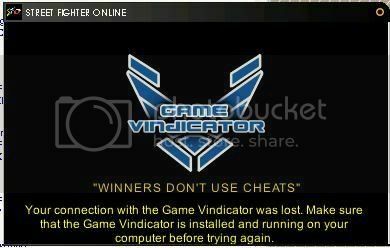 As ive said hopefully I haven't been banned(for no reason) or its a GV bug considering the logo above =/. Sorry for double posting, but I got to say this.. If you are sure that you have no GV program running... Then try restarting you computer. Make sure you don't have GV set to startup by going to Start, Run, Type in msconfig, Click the startup tab, and make sure that no kind of GV option is checked. For that second screen... I know that screen pops up if you have your computer set to "Standby" mode. To turn off standby in Windows XP. Right Click Desktop, Click Properties, Click Screen Saver Tab, then click Power Button, and from there you can turn off Standby. Quote[/b] ]I dont think you should be saying that or doudle posting here.....i never had that problem with vindicator thankgod its all good around here...but i have a question about vindicator when will it be able to be used in windows vista??? Noone knows when will there be a Vista version. Hmm...I happend to me once..but it was fine once I restarted and opened the SFO window again. hmm..try reinstalling GV? might work. And yea make sure your GV is running while the SFO window is displaying. and run your GV before you open SFO window....hopefully you are aware of that ..if all fails. Thanks for the update staff, I am sure people who are having trouble running GV on vista will sure be happy . Well I'm running mine on XP, and the GV seems to always lag me out now. When i join matches or play story with the GV, it always freezes and lags. When I don't use the GV and play SFO, the gameplay is smooth. whats wrong with my vindictator? I tried logging in MAssacre right.. I got banned as you all know..
Then months later. I tried logging in now with new account i still get kicked out.. I'll tell you what's wrong. Yoooooooou Cheeeeeeeeeeeeeeeat. ~DSA~Massacre, you were most likely i.p banned.